Richard Alpert was born 6 April in 1928, 1931, or 1933, (depending on whom you believe) in Boston, Massachusetts. First takes psilocybin in 1961 with Timothy Leary. Becomes an integral part in the Harvard Psilocybin Project. Works with Leary and Ralph Metzner to rewrite the Tibetan Book of the Dead as The Psychedelic Experience. The intention is to provide a manual which will serve to establish an appropriate "setting" for the experience of such drugs as LSD, psilocybin, mescaline and DMT. Dismissed from Harvard with Leary in 1963. Involved with the Zihuatanejo Project, the IFIF ( The International Foundation for Internal Freedom ) and the Castalia Organization at Millbrook, all of which were attempts to realize a psychedelic utopia as presented in Island by Aldous Huxley, and Glass Bead Game by Herman Hesse. Disillusioned with the failure of these utopist projects, he travels to India in 1967 and encounters his spiritual teacher, Neem Karoli Baba. 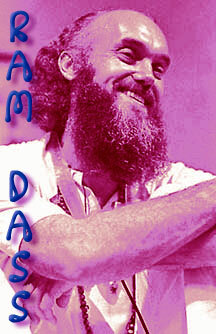 Alpert receives the name Ram Dass, or "servant of God". Returns to the United States to pursue his sadhana, or "spiritual journey". In 1974, Ram Dass creates the Hanuman Foundation. Co-founds the Seva Foundation ("service," in Sanskrit) in 1978, an international organization dedicated to relieving suffering in the world. On 19 February 1997, Ram Dass suffered a stroke which left him paralyzed of the right side of his body and limited his ability to speak. He is still said to have his memory intact and is able to understand what is said to him. For more information, see the link below. The latest issue of "Utne Reader" has a little column about Ram Dass and tells about him waving his left arm in the air and saying, "Finally! The Sound of One Hands' Clapping!" Phone conversations and visits with friends are helping Ram Dass practice speaking so words are coming much more fluently to him. He's been getting out more; to the store, to the bank, visiting with friends; all the little steps in returning to Living. "I had plenty of LSD, but why take it. I knew what it was going to do, what it was going to tell me. It was going to show me that garden again and then I was going to be cast out and that was it. And I never could quite stay." "When you say, "I can't comprehend it," it's because the thinking mechanism you have works with time- so time and space are the matrices against which you think. The predicament of dimensions which are not linear- not linear time or linear space- where here and now are both here, and now and then are both now- those are ones we can't think about." "I don't have a model. All I can see is that I am a teacher and as a teacher you collect more. You see, the peculiar predicament that I'm in is that I go back to the feet of this little old man in a blanket and I'm in the relation to the guru of chela. It's his trip, not mine anymore. I am in the role of service." Robert Altman Photography: collection of photos of the 60's and later, candid portraits of many of the personalities and events of the time.